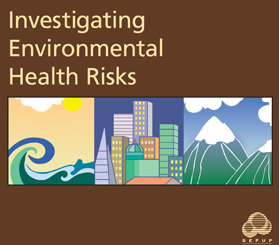 Investigating Environmental Health Risks is a SEPUP module designed for use in grades 8–12. The module contains a series of 8 activities that provide approximately 3 weeks of instruction. This module focuses on environmental health risk concepts such as sampling, testing for contaminants, parts per million, and acute vs. chronic toxicity. Students explore risks associated with everyday activities and those associated with the environment, such as the clean up of Superfund (toxic waste) sites. They test black-eyed peas for simulated pesticide residue and model how substances are tested for acute and chronic toxicity. Students then read about and evaluate evidence related to two environmental health risks. Students are assessed on their ability to use evidence and identify trade-offs when making a decision.